The DNC Change Commission held its final (hour-long) meeting this afternoon (by conference call). The Commission approved a draft report that recommends converting most automatic unpledged “superdelegates” to pledged delegates who will fill slots reflecting the voter preferences in their state’s primary or caucuses – thus becoming automatic, pledged, voting convention delegates. The DNC Rules and Bylaws Commission (RBC) will consider the Commission’s report and then forward proposed delegate selection rules to the DNC for action later in 2010. Frank has more on superdelegates, but FHQ will focus on the primary timing aspect of the proceedings today. Calendar: Under the Commission’s proposal numerous states (including Virginia) will have to move their primaries back to after March 1. It will be easier to achieve date changes in 2012 if the RNC agrees to have a similar starting date. Nevertheless, some states will be in a situation where there is a state mandated primary date which does not comply with the DNC’s schedule. The RBC will reexamine the delegate selection rules which provide for sanctions and exceptions. No, there's nothing new there and FHQ has certainly documented the potential pitfalls in this March 1 plan if the Republican Party does not follow suit with a similar calendar. I'll have more when Frank gets the full recommendations up. To all our readers, commenters and contributors, FHQ wants to wish you all the merriest of Christmases and the happiest of new years. This site is nothing without you. Thank you. Have Things Really Gotten This Bad for Democrats? California remained the most populous state, with a July 1, 2009, population of 37 million. Rounding out the top five states were Texas (24.8 million), New York (19.5 million), Florida (18.5 million) and Illinois (12.9 million). "This is the final set of Census Bureau state population estimates that will be published before the official 2010 Census population counts to be released next December," said Census Bureau Director Robert Groves. "We are focused now on ensuring we get a complete and accurate count in 2010. The census counts will not only determine how many U.S. House seats each state will have but will also be used as the benchmark for future population estimates." Wyoming showed the largest percentage growth: its population climbed 2.12 percent to 544,270 between July 1, 2008, and July 1, 2009. Utah was next largest, growing 2.10 percent to 2.8 million. Texas ranked third, as its population climbed 1.97 percent to 24.8 million, with Colorado next (1.81 percent to 5 million). The only three states to lose population over the period were Michigan (-0.33 percent), Maine (-0.11 percent) and Rhode Island (-0.03 percent). The latter two states had small population changes. Net domestic migration has slowed dramatically in many states in the South and West, including Nevada, Arizona, Idaho, North Carolina, South Carolina and Montana. Several states have negative net domestic migration, which means more people are moving out than moving in. Florida and Nevada, which earlier in the decade had net inflows, are now experiencing new outflows. Louisiana’s July 1, 2009 population, 4.5 million, is up 40,563, or 0.91 percent, from a year earlier. The estimated July 1, 2009, population for Puerto Rico was 4 million, up by 0.32 percent (12,735) from one year earlier. The population to congressional seat gain/loss report should be up later this week sometime. I'll get an updated map for 2012 up when that information is made available. Who's Happy with a the Parties' Tentative Outline of a Primary Calendar for 2012? On another note, we'd like to apologize for being quiet the last few days. Winston Salem got hit by the snowstorm that has made its way up the eastern seaboard and, well, I've been distracted. Hopefully something will be up late tonight and with some more regularity this week. Are liberals serious about this? FHQ is sure some are -- there are only 35 votes on that poll -- but c'mon. I don't understand the purism on the extreme end of both parties. If you want to get something -- anything -- done, you have to have members of your party in power (And yes, that means members of the same party with differing viewpoints.). Undercutting this president or any other is simply political fratricide. All or nothing is no way to approach American politics. It never has been, and in a supermajoritarian body like the Senate, it never will be. Well, the early states, of course. First, it’s only 2009 and anything could happen. President Barack Obama didn’t win New Hampshire last year, so his loyalty to the local cause may not be as urgent as we would like. It’s possible too, of course, that he has other things on his mind. Additionally, who knows which late-calendar state is quietly plotting against us? Remember Michigan? Remember Delaware? Challenges to New Hampshire’s first-in-the-nation status can come from anywhere at any time, regardless of what the party leaders are saying today. I don't know that I buy the "Obama didn't win here, so he might not care one way or the other about our primary status" logic. The president will need New Hampshire in the general election in 2012. [It is one of only three states that flipped sides between 2000 and 2004, after all. New Hampshire is likely to be competitive.] And the Democratic Change Commission has not even considered stripping the Granite state's of its distinction. In most years, there has at least been some discussion of why New Hampshire, and that was true of the Change Commission's discussion as well. However, that action was never a vital part of the mission of the group. Now, it could be that the Democratic Rules and Bylaws Committee looks at the Change Commission's recommendations and decides that New Hampshire and the other exempt states are too favored when they decide on the rules for 2012 over the summer, but there is absolutely no indication that that is going to happen. On the second point, all FHQ has to add is what we have been saying all along. For there to be true reform of the primary process or at least meaningful sanctions for rules violators, the parties will have to coordinate their efforts and represent a united front. This is something New Hampshire and its citizens should be highly interest in. Both parties are letting the New Hampshire/Iowa question slide for this cycle, and as such, the only real threats to the Granite state's status are rogues states like Florida and Michigan. And even if the parties cannot offer a cohesive rules regime on the 2012 presidential nominations, the Granite state still has the easiest time of shifting its primary date as any other state. The secretary of state, Bill Gardner, has the ability to place the primary wherever he wishes while most other primary states have to get such a change through the state legislature and past the governor -- something that is easier said than done. But New Hampshire isn't the only early state with its eyes on the 2012 calendar rule-making. South Carolina is also keeping watch (...and also, like their Granite state brethren, taking the early news of the 2012 rules with a grain of salt). This is something FHQ should have done when this interactive presidential approval tracker was first posted over the summer. Better late than never, I suppose. You can now find a link to the USA Today's Interactive Presidential Approval Tracker in the left sidebar. Obama's approval has come up too much in the comments in the time since this summer not to have a permanent and up-front link to this tool. Enjoy and use it wisely. 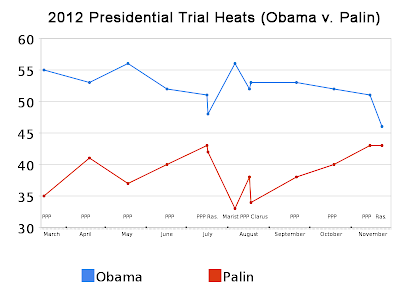 You can find the archive of all the 2012 trial heat polls here. In a month when President Obama slipped into the 40s against each Republican polled against him in a hypothetical 2012 general election match up (via Public Policy Polling [pdf]), things obviously were not looking that good across the board. In an overall sense, we quickly get a feel for that tightening simply by looking at the trendlines for each of the prospective Republican presidential aspirants (There's now even a trendline for Minnesota Governor Tim Pawlenty -- see below and in the left sidebar). There isn't really much to the poll other than to say that overall, things are much closer than they were, say, at the beginning of PPP's process of looking at the the 2012 back in March (Palin) and April (Gingrich, Huckabee, Romney added). And that largely tracks with the president's approval numbers throughout the year. FHQ would be remiss, though, if we didn't at least bring up a few nuggets from the internals of the poll. Huckabee does the best of any of the Republican candidates at pulling together the most McCain voters (85%) and minimizing the number of repeat Obama voters (89%). The former Arkansas governor was the only Republican to keep Obama's support among his former voters below 90%. 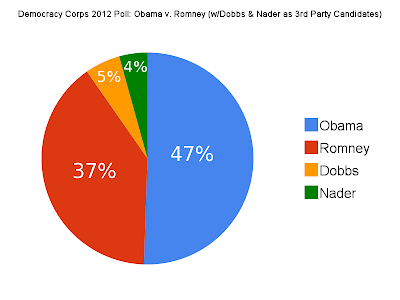 President Obama is still approaching 90% approval among liberals and is right at two-thirds approval among moderates. Not surprisingly, the president is taking the biggest hit among self-described conservatives (only 15% approve). Sarah Palin is the most favorable candidate to conservatives, but both she and Mike Huckabee garner 79% support from the group against the president. Obama consistently loses the 65+ set and essentially breaks even (to slightly loses) the 46-65 demographic to all the Republicans polled. However, the president is well above 50% with everyone under 45. Palin is the most favorable Republican among Hispanic respondents, but only reaches 37% favorability. The president continues to hold over 90% support among registered African American voters and about two-thirds of Hispanic voters against all four Republicans. Men still prefer Republicans and women Obama, but this is noteworthy because it is the first time Sarah Palin has led the president among men (48-45) in a PPP survey. The quirk is gone (...in December at least). 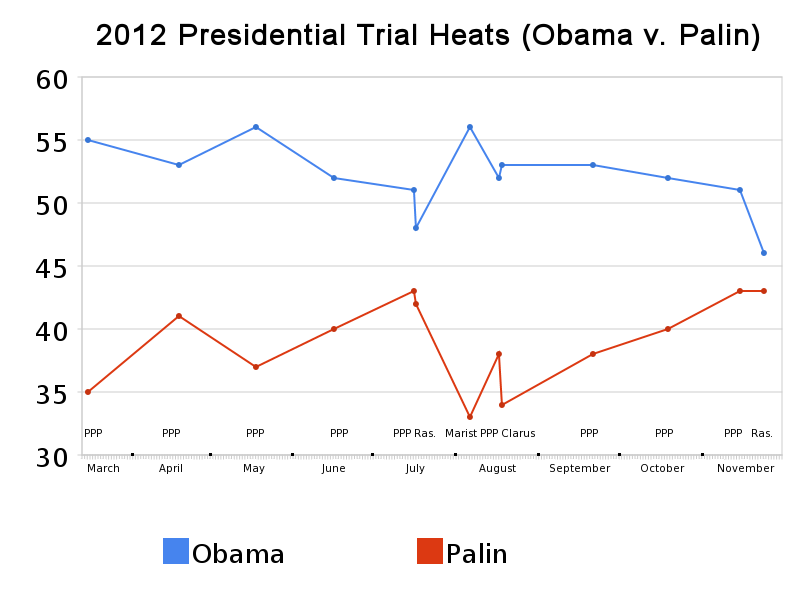 Obama didn't sweep the South as he has on several other occasions in these PPP polls. Instead, the president was swept in the region where the Republican Party found its base in the 2008 presidential election. More troubling to Obama from an electoral standpoint is that the president was swept by all four Republicans in the midwest. 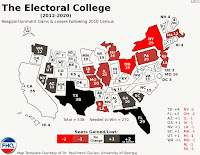 The president was able to make inroads in the peripheral South in 2008 and can potentially afford to jettison states like Virginia and North Carolina in 2012. But if Michigan and Indiana and Ohio begin to creep into the mix in terms of competitiveness, things could get interesting in the fall of 2012. Much of that will depend on the state of the economy, though. What will January and a new year bring? Stay tuned. 1. John Thune has your gubernatorial presidential aspirations right here. ...in the Senate. The South Dakota senator is still FHQ's 2012 darkhorse of the moment. I still think 2016 is more likely, though. If Thune is anything, it's shrewd. 2. South Carolina Republicans are like Idaho Republicans: They want closed primaries in the presidential delegate selection races in the Palmetto state. 3. Local fare: Cal Cunningham's chances in North Carolina depend on DSCC investment. ...in his primary race against Elaine Marshall first (to even have a shot at Richard Burr). 4. State of Elections has another great redistricting reform post up. Read away. 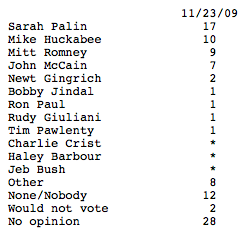 1) Palin is ahead of Obama among men (a first). 2) Obama didn't sweep the South this month. Every GOP candidate was ahead of the president in the region most loyal to the GOP and the midwest isn't looking too good either. 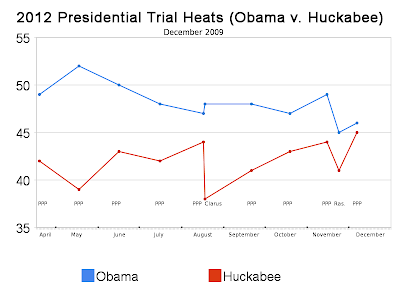 3) Huckabee was the only Republican to break even in terms of favorability/unfavorability. The other three Republicans had higher unfavorables. 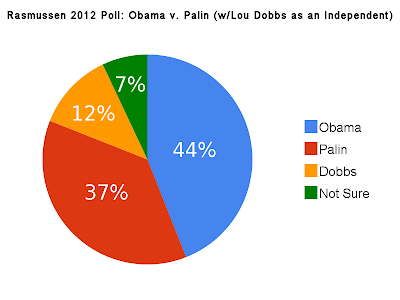 4) Palin still has yet to bring Obama under the 50% mark in these PPP polls. 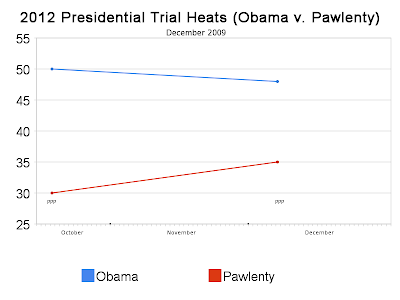 *Two polls now for Pawlenty (v. Obama) means we have a new trendline to add to the sidebar. The Concord Monitor has a great piece this morning looking at the thinking within both the Democratic and Republican Parties concerning the rules (RE: timing) for 2012 presidential delegate selection. The consensus seems to be that the Democratic Change Commission and Republican Temporary Delegate Selection Committee (meeting today) are both committed to closing the window (of time in which primaries and caucuses can be held) to exclude February from the equation. The Democrats are still willing to let Iowa, New Hampshire, Nevada and South Carolina go in February and the Republicans are committed to same thing (with the exception of Nevada*). Still, the commitment appears to be there on the part of both parties to scale the length of the presidential primary process back with regard to timing. Both groups making 2012 recommendations are committed to this, but will the actual decision-makers within the parties (the Democratic Rules and Bylaws Committee and the full RNC) who will sign off on this actually do that? That is the question of the moment. For the time being, though, the fact that the parties are working separately together on this speaks to the idea that both acknowledge the necessity of teamwork to change the system and avoid additional Florida and Michigan situations in either party. NOTE: This article has also done a good job at looking at some of the rules changes from 1996 onward that brought the primary system to where it was in 2008. A good read. *What will Nevada Republicans do if this comes to pass? It seems like they would have an incentive to shirk on this discrepancy if the penalty isn't just right to dissuade them. That will come up at some point. Thoughts on the Special Democratic Primary Election in Massachusetts Today? 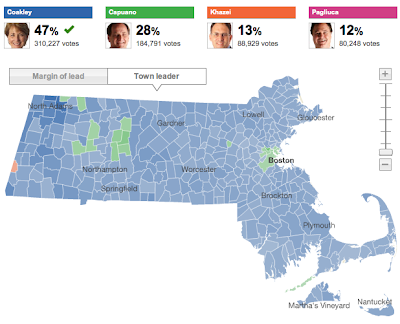 UPDATE: The map above shows the complete results with 100% reporting. With 95% of the precincts reporting, Democratic Massachusetts Attorney General, Martha Coakley, and Republican state senator, Scott Brown have earned their respective parties' nominations to face off in the January 19 special (general) election to succeed Ted Kennedy in the Senate. Coakley, in a multi-candidate race nearly reached 50% (at 47% as of now) while Brown amassed over 80% of the Republican primary vote. It may not be the most exciting thing in the world, but there will be a high profile election on January 19 and FHQ will be watching. 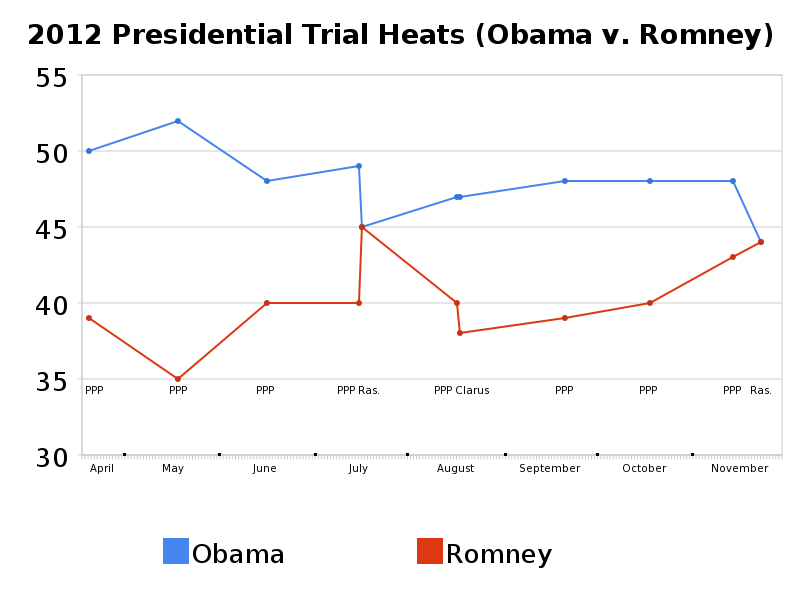 Tom Jensen over at Public Policy Polling's blog got the ball rolling on this today, by giving us all a sneak peek into the firm's monthly 2012 presidential trial heat poll (due out Thursday). The early conclusion? The former Arkansas governor's commutation of Maurice Clemmons, who subsequently went on a shooting rampage, killing four Washington state police officers, has not affected Mike Huckabee's favorability compared to a few weeks ago. And he'll be even closer against Obama than he has been all year in the head-to-head match up. 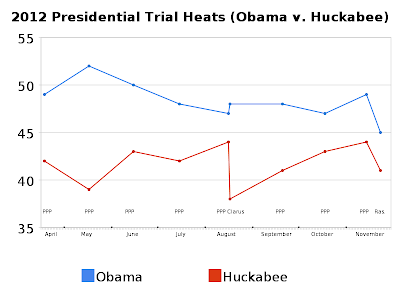 Granted, some of the reaction has been Huckabee Unscathed and Huck holding on and FHQ isn't really buying that due to a couple of caveats (We would add a "yet" to the end anyone attempting to glean a long-term pattern in all of this.). First, I'm treating this like the McDonnell thesis revelation in the Virginia gubernatorial race. That news had been out in the open for two solid weeks before there was any noticeable tightening in the race between Bob McDonnell and Creigh Deeds. I don't think that the two week pattern is any hard and fast rule for finding the true impact of some moderately large piece of news (positive or negative), but the thesis example does indicate that it takes some time for that news to filter into the public's consciousness and into survey results. 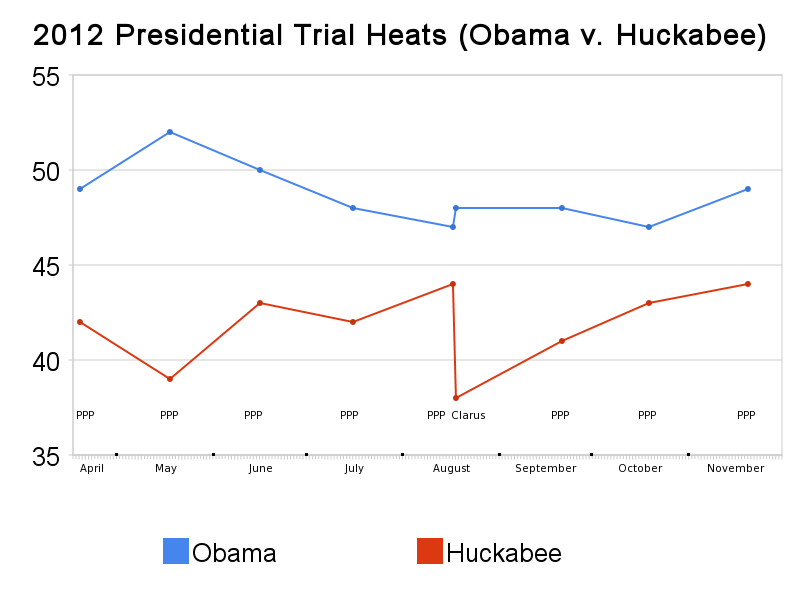 In this case, the Huckabee news broke coming out of Thanksgiving weekend. Were/are people even paying attention? And speaking of attention, all this Huckabee speculation concerns 2012. Some people -- present company included -- are certainly thinking about that election, but most out there are not. This Clemmons/Huckabee connection isn't like the McDonnell thesis; it did not come out in the middle of a campaign. Well, the invisible primary campaign is active for the 2012 Republican nomination whether anyone wants to admit to that or not, but that is on the candidate end and not the voter end of the matter. Long story short, then, this matter has not fully played itself out yet. It is just too early. It would have been different had this happened in the midst of the actual 2012 campaign or if PPP had posed a question about the Clemmons situation prior to asking the Huckabee favorability question. But it didn't. As such, wait for the effect. Keep an eye on the January numbers. Who is going to win this thing, FHQ readers? Will Coakley be able to maintain the same level of support at the polls today that she has had through most of the polls that have been conducted in this short race. Or will Capuano mount and complete a comeback victory for the Democratic nomination to potentially succeed Ted Kennedy in the Senate? On Tuesday 8 December 2009, Massachusetts will hold a Special Primary for the Senate Class 1 seat. The seat is currently held by Senator Paul G. Kirk, Jr. who was appointed 24 September 2009 by Massachusetts Governor Deval L. Patrick to fill the vacancy caused by the 25 August 2009 passing of Senator Edward Moore "Ted" Kennedy (Democrat). Dates: Special Primary to fill the seat: Tuesday 8 December 2009. Special Election: Tuesday 19 January 2010. Next regular election: Tuesday 6 November 2012. Polling hours are 7:00a EST (1200 UTC) to 8:00p EST (0100 UTC). By local option, municipalities may open their polls as early as 5:45 a.m.
As to timing, the discussion was relatively brief and consistent with prior discussions – Iowa/NH/SC/Nevada can go after Feb. 1, every other state goes after March 1, the rules should encourage regional clusters by offering incentives such as bonus delegates, the RBC will address enforcement procedures and sanctions, and the DNC will try to coordinate timing with the RNC rules committee. The RNC coordination process is ongoing. Commission members recognized that the best hope for a spread out process lies with agreement with the RNC on starting date, both parties imposing the same penalties for going out of turn, incentives to states to move back and cluster, and the states recognition that frontloading is no longer the best way to get attention. One caveat – the Commission should consider the effect of offering bonus delegates both for moving back and for clustering – too many bonus delegates may distort the traditional delegate allocation which is typically based on Democratic vote and population. Now the puzzle pieces are starting to come together in terms of both the Democratic Party and Republican Party coordinating their efforts to curb primary frontloading. Those efforts are certainly still in their formative stage, but as FHQ has indicated, if reform of the nomination process is truly desired, the two major parties will have to work together to incentivize going later in the process and punish those states that go too early. DemRulz also has in that post (linked above) a look at the prospects for change in terms of the caucus process and the folks formerly known as superdelegates. #1: recommended encouraging regional primaries and spreading out the calendar – with incentives (ie – bonus delegates). RBC to determine incentives. (We did not address penalties or how to handle when a state’s legislature breaks the windows without the party’s permission). 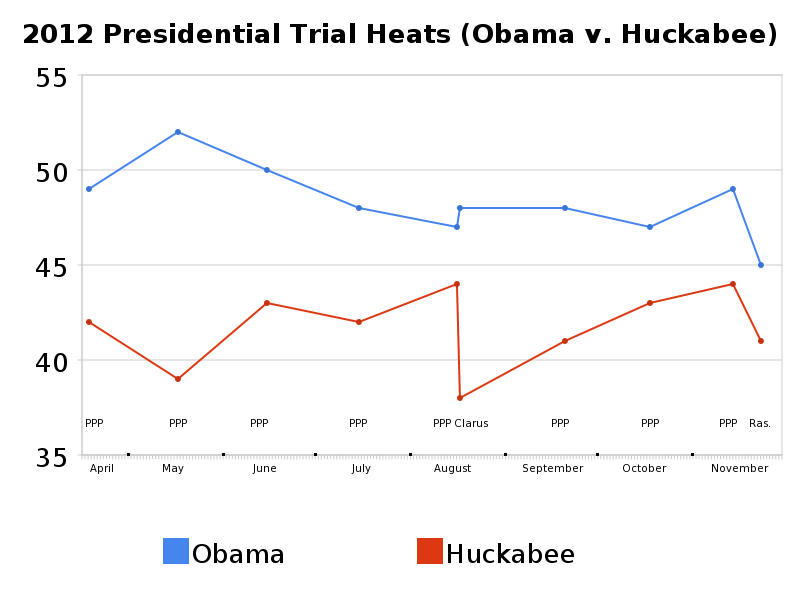 Who Gains the Most if Huckabee's Out for 2012? The Democratic Change Commission is scheduled to hold its final meeting at 10:30 am on Saturday December 5 at the Capitol Hilton, at 16th & K Sts. NW, Washington DC. The group is to make recommendations to the DNC by the first of the year and this is the final meeting. However, whether that means those recommendations are made public tomorrow is up in the air. By January 15, the Republican Party will present a summary of the evidence it will be presenting at the upcoming trial. This will include a copy of the expert report by one of the party’s witnesses, Michael Munger, who is a professor of political science and an expert in political parties. Then, there will be another status conference on January 26 to set the details for the upcoming trial. FHQ might try and pull some strings and get a hold of that report if possible. 2. What exactly happened to those Chris Daggett supporters on November 3? David Redlawsk (at the Eagleton Poll) has a go at explaining it. 3. The Democrats got their man in North Carolina to challenge Richard Burr. We'll see how that turns out. They thought they had their man in 2002 with Erskine Bowles. That didn't work out well in 2002. ...or 2004. But FHQ is on the ground here in the Old North state and has a vested interest in a competitive race. 4. Also, notice that State of Elections (the blog of the William and Mary Election Law Society) has been added to FHQ's blogroll. Welcome State of Elections. 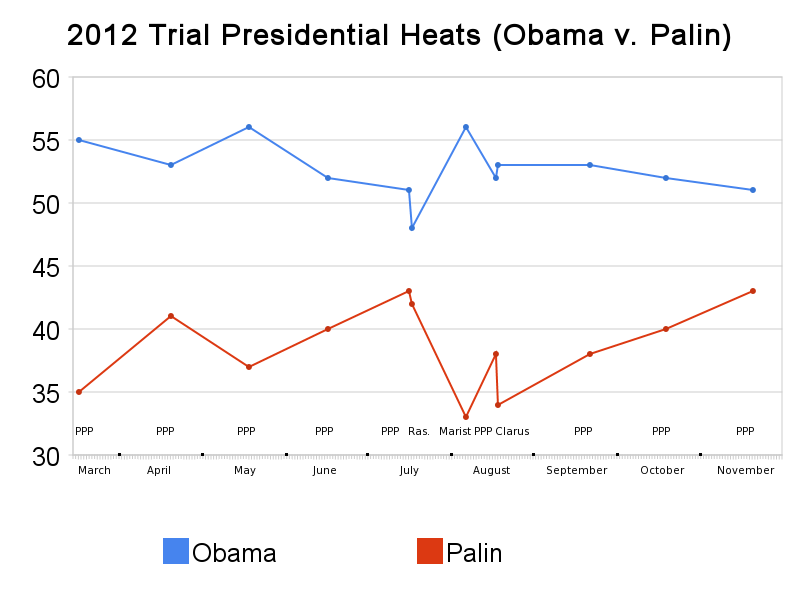 Nate Silver is of the opinion that the latter may also find some benefit (...in the nomination race). Who is Unknown Republican X? FHQ's money is on John Thune. But is he more 2016 material than 2012? Hat tip to Paul Gurian for the link. FHQ hasn't done a "The Links" post in quite a while, but there are few interesting things floating around in my neck of the virtual woods that I thought I'd share with FHQ readers. "Florida voters will likely have the opportunity to inject some competition back into legislative races next November. Fair Districts Florida, a nonpartisan issue committee, is sponsoring two ballot measures that will establish fair and impartial standards for redrawing state and congressional district boundaries every decade." There has been a bill introduced in the New Jersey Assembly to require the governor to fill US Senate vacancies in the state's delegation with someone of the vacating senator's party (Frank Lautenberg, New Jerseyans are looking in your direction. Alternate question: Are New Jersey Democrats a little antsy about what Governor-elect Christie would do if confronted with that situation?). This is akin to the process that unfolded in Wyoming in 2007 following Sen. Craig Thomas' (R) death. Democratic governor, Dave Freudenthal, was required to choose someone from among three selected options put forth by the Republican Party in the Equality state. 3. Finally, FHQ is always tickled pink at how campaigns respond to new media, both for the entertaining pitfalls and masterful successes. This CQ piece on political ads on Hulu is fascinating, particularly for a campaign's ability to target particular audiences. That evolution has been something to take in. 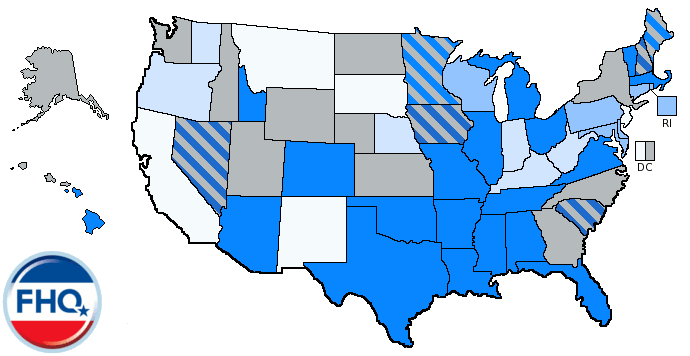 Q: If the 2012 Republican presidential primary or caucus in your state were being held today, for whom would you vote? And no one candidate cleared the 20% barrier either. There's nothing like Black Friday for a 2012 polling dump. 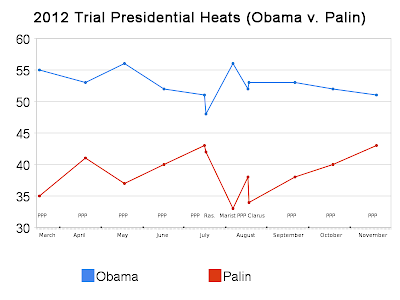 Earlier this week, Rasmussen provided us with its first glance at the 2012 presidential trial heats since July and back in the summer, the firm only included Romney and Palin against Obama. 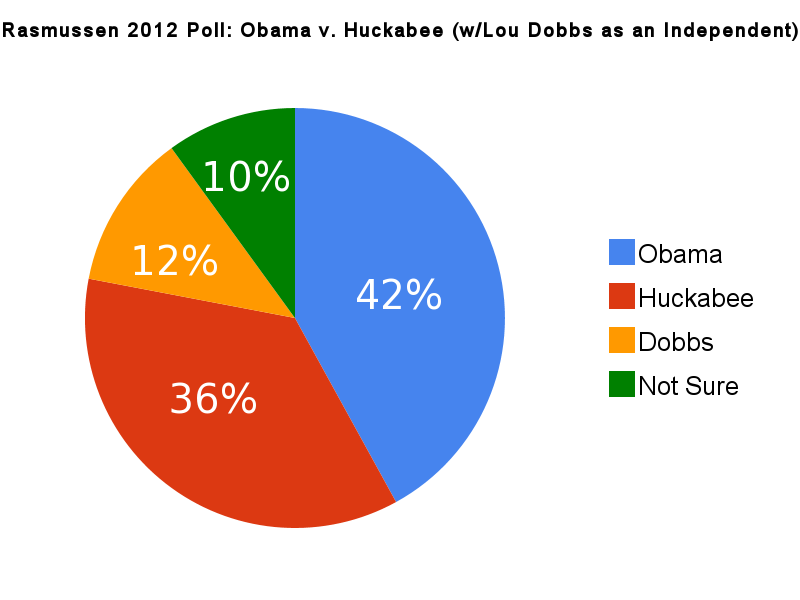 This time they have added Mike Huckabee to the mix, and more interestingly, Lou Dobbs as a third party candidate. But we'll get to that moment. I'll give you the numbers and figures to start and return later to add in the analysis. Not surprisingly, Lou Dobbs hurts the Republican candidates more so than the president when he is included in the line of questioning in the survey. 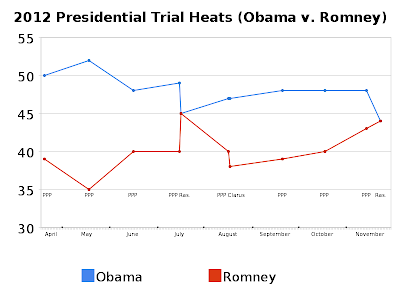 Romney is hit the hardest; losing 10% off his total from the two candidate question. But the former Massachusetts governor had the most to lose since he did the best of the Republicans against Obama in the two candidate polling. And here's one more from Democracy Corps [pdf] with Dobbs and Nader included as third party candidates. I just wanted to take some time out from the day to wish all our readers a Happy Thanksgiving. I've said this before and I'll say it again, we are nothing without of readers/commenters. Thank you all for making FHQ what it is. There has been a lot of talk about true conservatives (think NY-23) and purity tests within the Republican Party lately. But what's been lost in all of this is a rare -- at least in terms of getting news attention -- instance of pragmatism. Late last week, the North Carolina Republican Party considered a proposal to discontinue allowing independents to vote in the party's primaries. "Unfortunately there are times when independents are swaying elections to a candidate that is not as conservative as we would like," said Onslow County GOP Chairman Patrick Lamb, identifying moderates as people like John McCain last year and George H.W. Bush in 1988. "We are not attempting to eliminate independents from the process. We absolutely need them," said Bob Pruett of Beaufort, chairman of the 3rd Congressional District committee, who supports the closed primary idea. "But we want to make sure that we have conservative candidates elected in our primaries." "History shows us that the passage of this resolution would not bode well for the goal of a Republican victory in 2010," state party Chairman Tom Fetzer wrote in an e-mail to executive committee members. "All of us know at least one Conservative Republican – and probably many more – that have switched to Unaffiliated out of frustration with the national or state Republican Party," the three lawmakers [Phil Berger, Paul Stam and Eddie Goodall] wrote. "Are we sending these Conservatives the right message and encouraging them to return to the Republican Party by telling them they cannot participate in a Republican Primary and can only participate in the Democratic Primary?" Obviously, there was a purist element within the NC GOP pushing this resolution, but they were voted down in the party's executive committee meeting this past weekend. Why? FHQ suspects that state party Chairman Tom Fenty is absolutely correct: with the state legislative elections coming up in 2010, North Carolina Republicans have an opportunity to win both chambers. Limiting the potential base, though, could have affected the calculus for attaining that goal (especially with unaffiliateds in the state growing by leaps and bounds). Now, why, you may ask, is this any different than what FHQ discussed recently in terms of the Idaho Republican Party's efforts to end the Gem state's open primary -- for much the same reason? Why, indeed? Again, it is up to the state to decide the extent to which its primaries are opened or closed to independent and unaffiliated voters. The state of Idaho, as we highlighted, has allowed not only independents but partisans of the opposite party to participate in primary elections for both major parties over the last nearly four decades. But in North Carolina, the system is slightly different. Technically, the Tarheel state's primaries are closed to independents, but a change to the law in allowed the state parties to decide whether they would invite independents to participate in their primary elections. The North Carolina Republican Party began allowing independents in in 1988 with the Democrats in the state following suit in 1996. And this not really an issue for the Republican Party in North Carolina to take lightly. 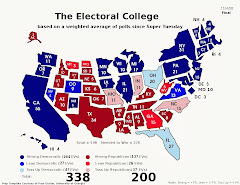 The conventional wisdom after the 2008 presidential election was that Obama's organizational efforts during the primaries in North Carolina helped push the president over the top in the Tarheel state in November; turning the state blue for the first time since 1976. Getting independents to vote for you in the primary has the potential to go a long way for a candidate when the general election rolls around. The dynamic, though, has the potential to be different in a midterm election than in a presidential election. Still, in the battle of pragmatism versus purism with in the Republican Party, pragmatism won out for once. FHQ has been closely watching the meetings of the groups within both national parties reexamining the rules by which delegates will be allocated and presidential candidates nominated in the 2012 election. And we have done our part to bring the developments to our readers (click on the Democratic Change Commission and/or Temporary Delegate Selection Committee tags at the conclusion of the post for the full discussion). And while there has been a fair amount of individual analysis here, we have been lacking in attempts to reconcile what each party is doing with its counterparts across the aisle. For all the talk about working together, there actually hasn't been any overt contact between the two parties other than a post at The Hill over the summer bringing the idea up. Of course, I've also tried to do my part here. Absolutely nothing revolutionary is going to get done on the presidential primary reform front unless the parties work together. And even then, FHQ is not necessarily of a mind that reform is acutely necessary. Democrats ended up with a winner in 2008 and Republicans, purity tests aside, got the candidate best positioned to actually beat any Democrat in a year that favored the party of Jefferson and Jackson. The weak links from the 2008 cycle are the ones being addressed now by both parties: what to do about caucuses (or the larger caucuses vs. primaries question), how can we stop frontloading, and for the Democrats, what should we do about those superdelegates? And though the Republican Party has items such as rotating regional primaries and instant runoffs on the table, FHQ is hesitant to take them seriously. What that means is that the Republican Party's goals are not necessarily congruent with those of the Democratic Party. On top of that, time is running out. [For 2012? Yes, for 2012.] The Democratic Change Commission's recommendations are due to the party by the first of the year in 2010. The Rules and Bylaws Committee will then decide upon the rules for 2012 some time over the summer; roughly the same time period the Temporary Delegate Selection Committee is slated to finish up its work. That essentially leaves about nine months for the parties to put their heads together on the matter of primary reform. Sure, that's an eternity in politics, but when distractions like health care and midterm elections pop up, the task becomes even more difficult. Besides, a year has already passed since the 2008 election and the parties have not actively opened a dialog on this front. They're going to fix that in nine months? Color FHQ bearish. FHQ likes how the Des Moines Register raised the alert a few weeks ago about the potential 2012 Republican candidates not coming to the state and now has a poll out concerning the prospects chances in the Hawkeye state's 2012 caucus. It is strange to juxtapose the overall numbers among all Iowans and then leave the "only Republicans" numbers for the footnote at the bottom of the graphic. Huckabee's well-liked overall and among Republicans. Sarah Palin, meanwhile, has cornered the market on opinion. Everyone has one about her; well, except for just 8% of all Iowans. Still, that's the lowest among all the candidates in the question. On the other end of the spectrum from Palin, though, are Pawlenty, Jindal and Pataki. All three have a lot of room to grow in Iowa since nearly three quarters of Iowans are unsure of who they are or how favorable they are of them. Of course, the main thrust of the write up in the Register was about Sarah Palin. While she doesn't do as well among Republicans (in terms of favorability) as Mike Huckabee, the former Alaska governor does top Arkansas' former chief executive among conservatives. 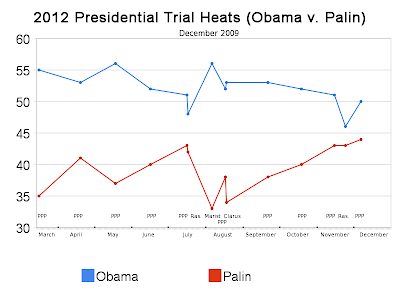 And last but not least, the Register tells us that Palin's favorability numbers are not unlike those of Hillary Clinton when she was setting out to run ahead of 2008 (opinion had solidified on both). But is that really the analogy they want to draw? Clinton did end up finishing third in Iowa behind Obama and Edwards. The bottom line? 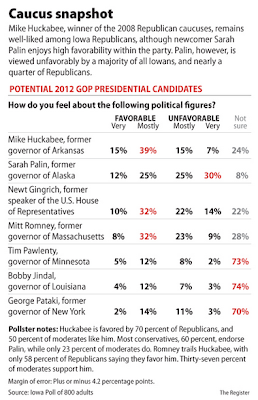 Palin has a steep climb even in a state that some have thought she'd seriously battle Huckabee for in 2012? 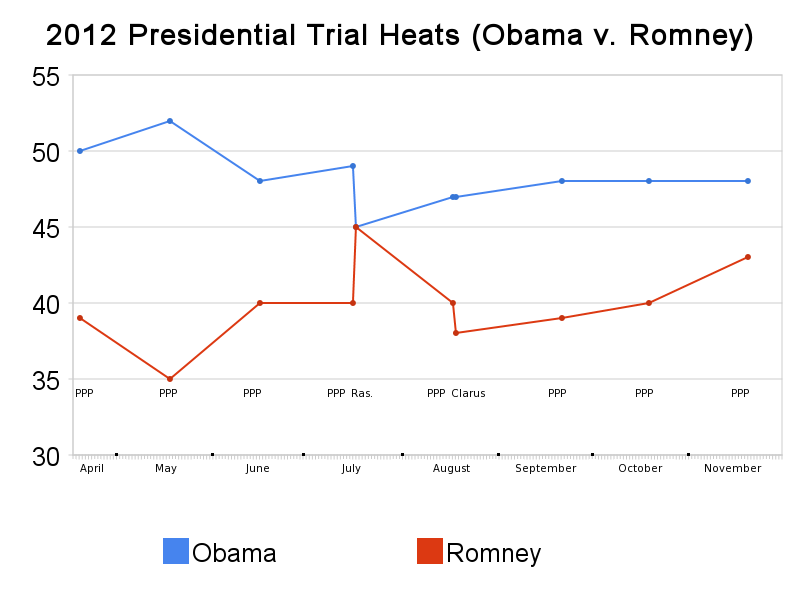 NOTE: Please note that you can now track past updates of these trial heat polls by clicking here or on the "2012 trial heat polls" tag at the bottom of the post. 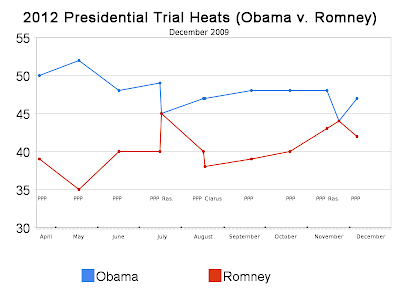 For the ninth straight month Public Policy Polling released a series of 2012 presidential trial heat polls matching President Obama up against four prospective Republican candidates. And despite the fact that Obama slipped below 50% for the first time in a few polls this past week (see Gallup, Quinnipiac, PPP), the president wasn't in any significantly different position relative to the Republicans than he was a month ago; just under 50% against all but Sarah Palin and still ahead across the board. Yet, this month while Mike Huckabee remained the closest to the president, he was not alone in that distinction. 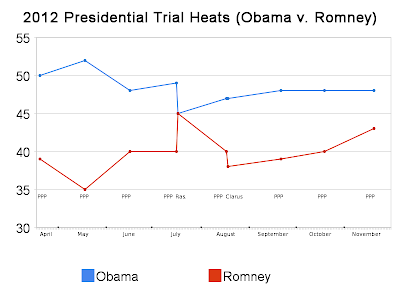 Mitt Romney climbed to within five points of the president as well, climbing above the 40% mark for the first time in any PPP poll this year. 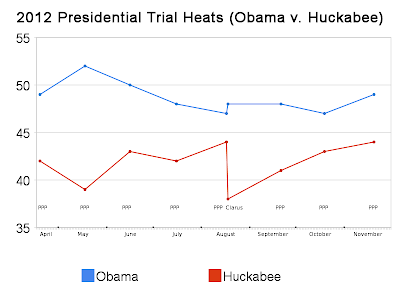 That said, Huckabee does better consolidating the conservative and Republican bases. 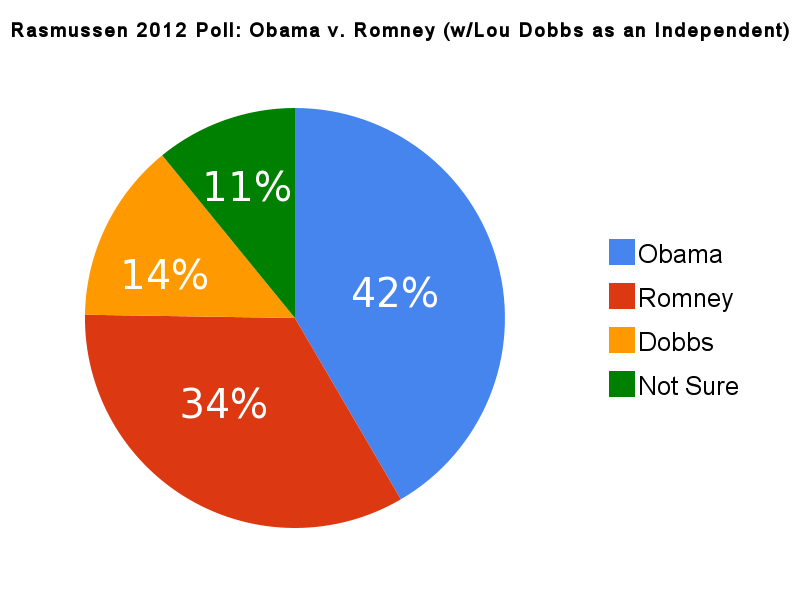 Romney, however, nearly evenly divides the independent support with the president. And that really demonstrates the current tension within the GOP; the battle we've been talking about here at FHQ since Obama claimed victory a year ago. Will Republicans nominate someone in 2012 from a far more conservative background than, say, John McCain, or will efforts be made to make the party's nominee more inviting to independent voters? That continues to be the question as 2009 draws to a close. What's more, this poll from PPP is not without its quirks. [No poll ever is, really.] First, the same bizarre regional disparity that popped up in the polling firm's July poll again reared its head this month. 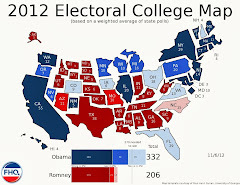 Obama inexplicably swept the South (except for a tie with Ron Paul) again while losing out completely in the midwest. I can foresee the midwest potentially being a problem for Obama in 2012, but there's absolutely no way that the South is vulnerable to Obama inroads; not even if Steve Schmidt's catastrophe occurs. Palin, indeed, proves to be trailing by the largest margin (a distinction shared with Ron Paul), but still loses the South while winning the midwest against the president. If that wasn't enough, Paul actually pulls Obama's support to its lowest level in any of PPP's surveys this year. But is that Ron Paul's impact or is the Texas congressman merely serving, as I asked earlier today, as a proxy for a generic Republican in a hypothetical race against Obama? There are enough undecideds in that match up to raise that question. Independents are not necessarily on board with Paul, but Democrats are least with Obama against Paul than against any other Republican in the survey. As Christian Heinze at GOP12 asked, "Is an Anybody But Obama theme starting to take hold?" Intriguing as that question is, FHQ is almost more interested in a slightly different question: Is an Anybody but Huckabee/Palin/Romney theme starting. Certainly, neither question is being answered very adequately at this point, not in the direct context of the 2012 race anyway. 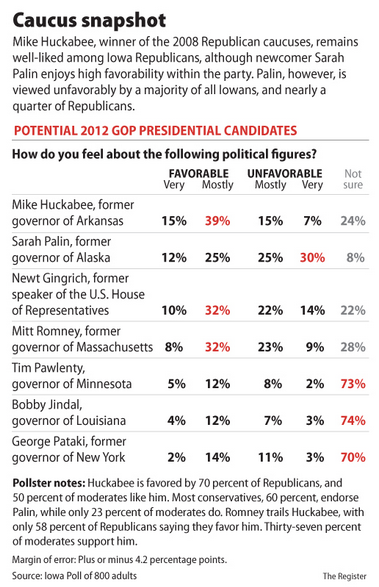 Newt Gingrich, Jeb Bush and especially Tim Pawlenty did not see anywhere near the numbers Paul has in this particular poll. And I say "especially" in Pawlenty's case because he doesn't carry the baggage that Gingrich and Bush carry and is unknown enough to potentially fill the void of generic Republican in a ballot question. 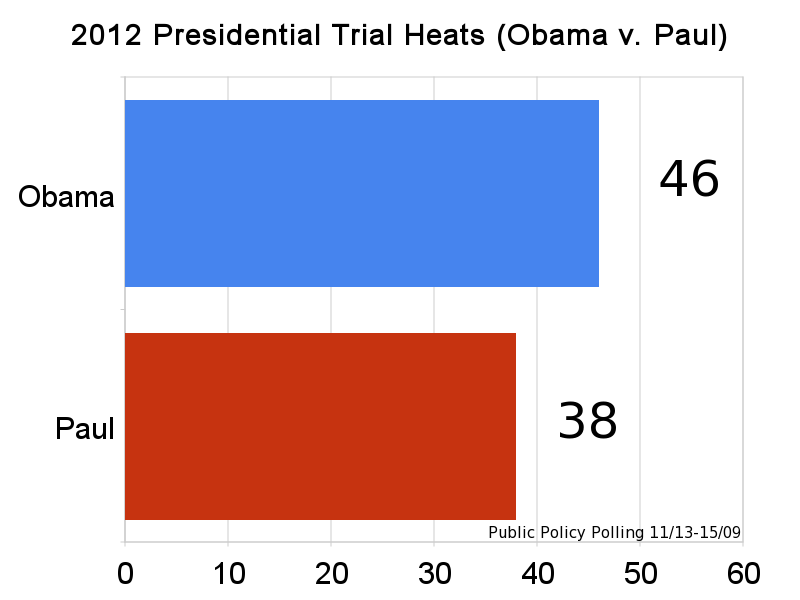 But Pawlenty from last month lags well behind Paul's numbers here. All in all, it was another interesting round of numbers from the good folks over in Raleigh. Ron Paul may have earned a spot in next month's poll simply due to his showing here. We'll see. 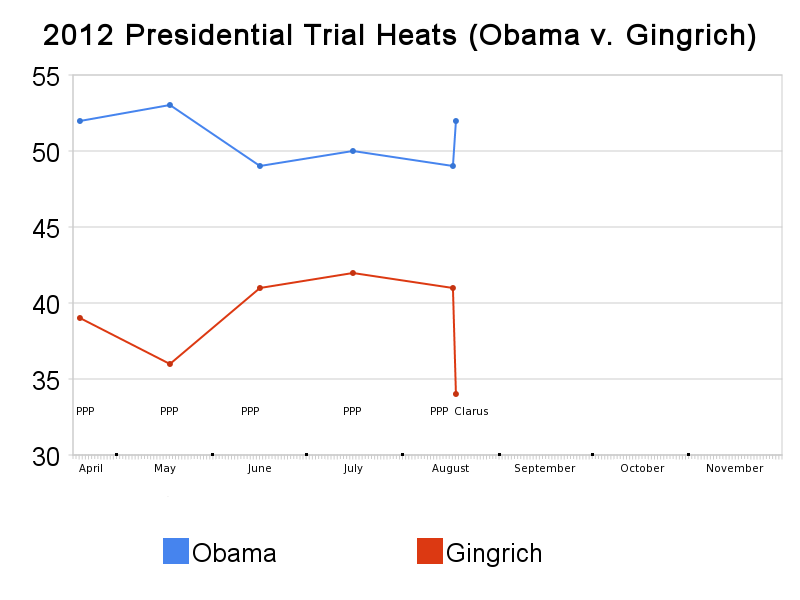 NOTE: And just as a bonus, here's the updated Obama/Gingrich trendline. 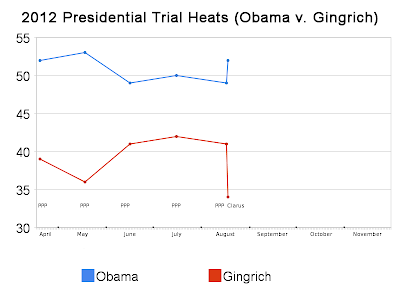 And no, it isn't so much an update as a reminder that Gingrich has not been polled against Obama since August. Ex Post Facto: Why Do New Jersey and Virginia Have Those Off-Off Year Elections Anyway? FHQ's biggest question? Is Ron Paul a proxy for a generic Republican candidate? Obama fares worst against the Texas congressman. And remember, this is among registered voters and not likely voters. As has been the case with other Temporary Delegate Selection Committee meetings, news from within the event (yesterday's meeting in Washington) took a bit of time to surface. Just as a refresher, the TDSC is the 15 member group that is charged with examining the rules under which the 2012 Republican presidential nomination will be governed. The group has met before, but very little has come out in terms of what they have been considering. Sure, there's been talk of regional primaries and perhaps even an instant runoff system, but the information that has come out of these handful of meetings has paled in comparison to the cornucopial plethora of news that has emerged from the two Democratic Change Commission meetings. Now granted, it always helps when there are people on the inside who are willing to share (Suzi LeVine and Frank Leone to a name a couple.) publicly. 1. RNC 2012 Rules underway Huckabee, Giuliani managers have testified. SOS from WA now testifying. 2. RNC 2012 hearing options on timing, rotational options, primary vs caucus systems. 4. RNC 2012 update, this will be the last public hearing with lots of ideas coming forward. Detailed proposals coming at December mtg. 5. RT @dcseth: @sanuzis Any talk of closed primaries? // no...that is up to states. Also speaking before the committee was Washington Secretary of State Sam Reed. FHQ has discussed Reed in the past. Earlier in the year, he was urging RNC chair, Michael Steele, to fill out the Temporary Delegate Selection Committee with other secretaries of state. [There are none.] For his part, Reed toed the company line: He pushed for the National Association of Secretaries of State's rotating regional primary plan. But he also added that voters would prefer a later start to the process and that "There is a growing call for a process that is logical, orderly and fair." Are you surprised that Iowa, New Hampshire and South Carolina had large contingents in attendance? No, I wasn't either. The last two points were more worthwhile anyway. Firstly, the next TDSC meeting will be in December when they will hear "detailed proposals." Again, the RNC isn't slated to vote on anything coming out of these meetings until next summer. Still, the GOP will have something on the table by the end of the year, the point at which the Democratic Change Commission will make their recommendations to the DNC. Finally, we also see that the neither the TDSC nor RNC are on the offensive to enact closed primaries (see recent FHQ discussion here). I briefly thought about a mass Republican switch to caucuses when I saw the "primaries vs. caucus systems" comment above, since caucuses are, on the whole, closed to independents and Democrats (from the Republican perspective). But Anuzis shoots that idea and the idea of the RNC forcing states to close their primaries (They can't.) down. Now, what did we learn from all this? There won't be anymore closed primaries than there already are unless the state governments make a change or state parties opt out in favor of a party-funded caucus. [Yeah, you knew that already.] We also learned that there is another Temporary Delegate Selection Committee meeting next month. It turns out that in both cases, it was a function of the fact that both had constitutional conventions to draft new guidelines for governing each state. That, in turn, disrupted the timing of gubernatorial elections. Prior to the adoption of the modern New Jersey Constitution, New Jersey governors served three year terms, with the last gubernatorial election under the old constitution occurring in 1946. In 1947, the legislature proposed a constitutional convention which was voted on as a referendum and approved by a majority of voters. The new constitution was ratified in 1947, and among many other changes, extended the governor’s term to four years. This extension, however, did not apply to the current governor’s (Alfred Driscoll) term, who had been elected under the old constitution. So, Driscoll’s first term, which had begun in 1947, ended in 1950. When Driscoll ran for reelection, the term limits of the new constitution applied, so Driscoll’s second term lasted for four years. The election to replace Driscoll occurred in November of 1953, and thanks to the new four year terms, every New Jersey gubernatorial election from then on naturally fell on an off-off year. In March 1851, while the constitutional convention was meeting, the Virginia General Assembly elected a new governor, as it had for the past 75 years for a three-year term. The newly elected governor Joseph Johnson was to take office on January 1, 1852, but in the ensuing months Virginia voters approved the new constitution which among other things expanded suffrage to all white male citizens 21 years or older who had been residents for at least two year and required the governor to be popularly elected to a four-year term. The constitution also prohibited the governor from serving successive terms, a prohibition that is still in place today. Soon after the new constitution was adopted Democrats met in convention in Staunton and nominated Johnson to run for governor. The first popular election for governor was held on December 8, 1851, but the results of the election were not certified until January 15, 1852. Not wanting to leave the Commonwealth without a chief executive, Johnson assumed the governor’s office on January 1, 1852 by rights of his having been elected by the General Assembly the previous March. On January 15, after the results of the election were certified, he was declared the winner of the first popular election for governor in the Commonwealth’s history and assumed the office on that basis on January 16. A series of unelected military governors during Reconstruction shifted the election cycle from one-year before presidential elections on the odd year to one-year after presidential elections on the odd year, and that pattern has remained ever since. This is interesting material from a new blog from the Society for Election Law at William & Mary. They just opened up shop on Monday, but this promises to be a site worth checking in the future. Click on the state links above to read the full entries on both New Jersey and Virginia. There's much more to the Virginia post.